When I visited the Bournemouth beach this time, which happened to be my second time, it seemed a lot more crowded than it was when I visited it for the first time on 31th March 2009. I visited it the 2nd time on 24th March 2012, for the same occassion, my birthday which happens to be on 26th March. I didn't feel a bit of monotony visiting it for the 2nd time. It was very quiet on the day I visited it in 2009. I was with my girl friend who is now my wife :). We stayed there overnight. The trip was sponsored by my girl friend and was a surprise for my birthday. I think we took a NationalExpress coach from Victoria coach station to Bournemouth. It was quite a walk until we checked in, in our hotel. We quickly headed to the beach and it was a nice and sunny day. There was hardly anyone seen on the beach which was very clean. We strolled a lot on the beach and then climbed on to a path which was on a higher altitude to the coastline and parallel to it. The view from the top was nice. We also tried viewing the ocean and the boats and ships in it through fixed paid telescope. The view through the telescope wasn't bad. It felt nice and peaceful to be lying on the beach on such a nice day in such a nice and balmy weather. I don't remember much about what we did then as I am writing this article after a bit more than 4 years. But I remember that we had nice icecreams on the beach and had a nice dinner in a near by Srilankan / South Indian restaurant (Address - 280 Old Christchurch Road, Bournemouth, Dorset BH1 1PH. Contact - 01202 318535 ). The food was awesome. We spent most of our time relaxing on the beach. For dinner I got a takeaway from a Bangladeshi restaurant. I remember that there were many drunk people having fun on the streets in the evening. After having a shower and after getting ready, the next morning, we had a nice breakfast in our hotel and headed to the beach again. We bought 2 tickets to see the Bournemouth aquarium called Oceanarium (Address - Pier Approach, West Beach, Bournemouth, Dorset BH2 5AA). It was quite nice with loads of fish, huge turtle, crabs, sharks and other strange sea creatures etc... of different shapes, sizes and colours. It was real fun to visit Bournemouth for the first time. The 2 main reasons for me to decide visiting Bournemouth again on my birthday, were the following : An article on London Metro mentioning about the pleasant weather and the world's biggest deck chair being positioned on the Bournemouth beach. It was a lot more sunny and hot compared to the day when we visited Bournemouth for the first time. We were accompanied by my brother in law ( Ravi Vasant ) and his wife, Prachi Dighe. This time we visited the beach in my wife's car. Parked it in a nearby car parking in the town centre. The charges for a full day parking were just 5 pounds. We were quite hungry and tried to find the Srilankan restaurant, but while searching we concluded that it was quite far away from where we were located. So we had fish n chips and a chicken burger on one of the piers. I don't remember the name of the restaurant. However, both the fish n chips and the cajun chicken burger were quite tasty. After having our lunch we quickly headed to the beach,which as expected, was quite crowded. Due to so many people, it looked quite colorful and like the Brighton beach. There were all sorts of people doing all sorts of things. There was one guy wearing a gorilla's costume and on it had worn a bikini ! A group of young boys and girls were dancing on a song which sounded Brazilian. 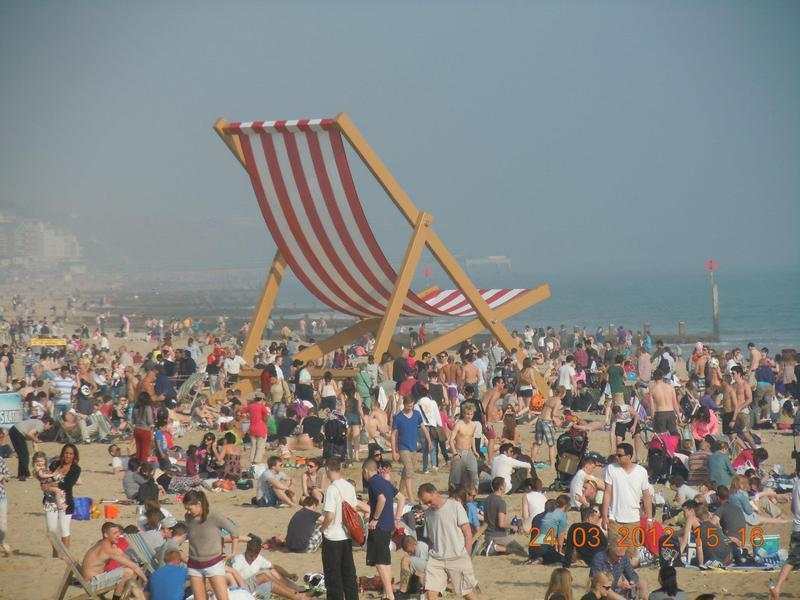 The biggest attraction was the world's biggest deck chair positioned on the beach. Almost everyone including me took pics of the huge chair. Unfortunately because of its huge size, it was not 'seatable' ! There were many other fun activities in and around the beach like Bournemouth aquarium, "Oceanarium", carousel with horses, artificial bungee jumping for kids, loads of restaurants, hot and cold food stalls, a bird aviary with loads of birds and a peculiar pair of talking parrots. I could clearly hear them say "Hello" in a British accent. They also seemed to talk something in English which was meaning less though. I have been to Bournemouth twice and wouldn't mind going there again.